Nantou County in Taiwan does not have the usual beach-based perks and attractions in an Asian country but it does have natural treasures that could rival other tourist destinations around the world. Nantou’s top draw is the Sun Moon Lake located in Yuchi Township. The other frequented destinations are mountains, hills, waterfalls, aboriginal villages, parks and recreational areas, one of which is the Sun Link Sea Forest Recreation Area. Sun Link Sea Forest Recreation Area is 41-hectares wide and 1,600 meters about sea level. Most tourists are compelled to come here to see the area’s famous waterfalls, soothing climate, lush mountain forests, campgrounds with wooden cottages, a spectacular view of Mount Hehuan, colorful and majestic maple trees and a Flower Center and Medicinal Center that showcases all sorts of flowers including Chinese herbal medicines and the endemic peonies. The maple trees turn brilliant red and look most inviting in autumn, while the peonies are best seen in April and May as they bloom. In summer, while other Asian destinations are sweltering, temperature in Sun Link Sea is a cool 20° Celsius. There are three waterfalls here, namely the 116-meter-high Qingyun Waterfall, Niaosong Waterfall found in the Songlong Rock area and Water Curtain Cave Waterfall also in Songlong Rock. The river has amazing crystal-clear waters with natural holes or wells along the riverbed. Also nearby is the Rhododendron Spring that is a beauty to behold for its curtain of dripping water. At the center of this recreation park is Jyuying Village, a traditional village that harmoniously blends nature, culture and modern technology. Within it stands the newly built luxurious Grand Hotel and Longju Hotel. Other spectacular sites in the area are Anding Bay, Siangsin Valley, Jyusia Valley and several cliff-side springs and rocks. There are no beaches or coasts in Nantou County since it is Taiwan’s innermost county. The county instead boasts of several natural reserves and parks that are similar to the Sun Link Sea area. Well-known Nantou reserves are Aowanda National Forest Recreation Area, Bagua Mountain National Scenic Area, and Jiujiu Peak Nature Reserve. 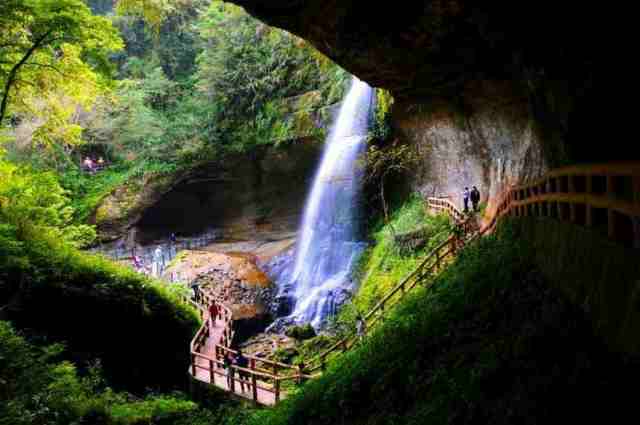 Nantou is also known for its mountains, national parks and traditional villages. The most popular and often climbed peaks are Hehuan Mountain and Jiujiu Peak; the leading parks are Sun Moon Lake National Scenic Area, Taroko National Park and Yushan National Park; while the most intriguing aboriginal villages are Formosa Aboriginal Culture Village, Ita Thao Cultural Village and Atayal Resort. The county’s capital and only city is Nantou City. Getting to Scenic Sun Link Sea Forest Recreation Area is as exciting as being there already. The road takes several 180-degree turns following the natural mountain terrain and landscape. The turns have been named after the animals of the Chinese zodiac. To get to the Recreation Area by car, take Freeway 3 and exit at the Zhushan Interchange going to Provincial Highway 3, and finally to County Highway 151. When coming by train, get off at the Taiching train station and take either a Taichung or Yuanlin bus going to Shanlixi. Get off at Xitou stop. Xitou: What Is It Exactly?